Manchester United were gunning for an unprecedented fourth consecutive Premier League title but much had changed before the champions' defence kicked off in August 2009. Cristiano Ronaldo joined Real Madrid for a world-record fee and Carlos Tevez switched to rivals Manchester City, who also signed Arsenal duo Emmanuel Adebayor and Kolo Toure, Everton's Joleon Lescott and Aston Villa's Gareth Barry. United bolstered their attacking line-up with the additions of Wigan Athletic winger Antonio Valencia and former Liverpool frontman Michael Owen. Yuri Zhirkov's move to Chelsea and Tottenham Hotspur's purchase of Portsmouth duo Peter Crouch and Niko Kranjcar were among the other big moves. Sir Alex Ferguson's side suffered an early setback though, as Premier League debutants Burnley enjoyed a dream start to life in the top flight when Robbie Blake's thunderous volley sealed a 1-0 win over the reigning BPL champions at Turf Moor. The early pace was set by Chelsea, who won their opening six matches under the guidance of newly appointed former AC Milan manager Carlo Ancelotti. Man City and Spurs both started with four wins on the spin, while Arsenal thrashed Everton 6-1 on the opening day. In a match that was voted the competition's best ever in the Premier League 20 Seasons Awards, Manchester United came out on top in their first meeting with Man City in dramatic style on 20 September. Summer signing Owen scored deep into stoppage time to seal a 4-3 victory at Old Trafford. That defeat and a run of seven consecutive draws soon after saw Man City slip out of the title running. Manager Mark Hughes was replaced by Roberto Mancini in December as they looked to close in on Harry Redknapp's Spurs and Martin O'Neill's Aston Villa, who beat United at Old Trafford to cap an impressive start to the season. Spurs' fine start to the season included a 9-1 rout of Wigan Athletic at White Hart Lane, in which striker Jermain Defoe scored five goals. The following month, Wigan produced a moment of magic themselves as Honduran defender Maynor Figueroa scored an outrageous free-kick from inside his own half in a 2-2 draw at the Britannia Stadium. Chelsea led the way at the turn of the year but Arsenal, inspired by the form of Spain midfielder Cesc Fabregas, briefly topped the Premier League table in March after a run of six consecutive wins. United leapfrogged them the following day and the Gunners' title ambitions slipped as they drew away at newly promoted Birmingham City, who eventually finished ninth, and followed that up with seven points from their final six matches. 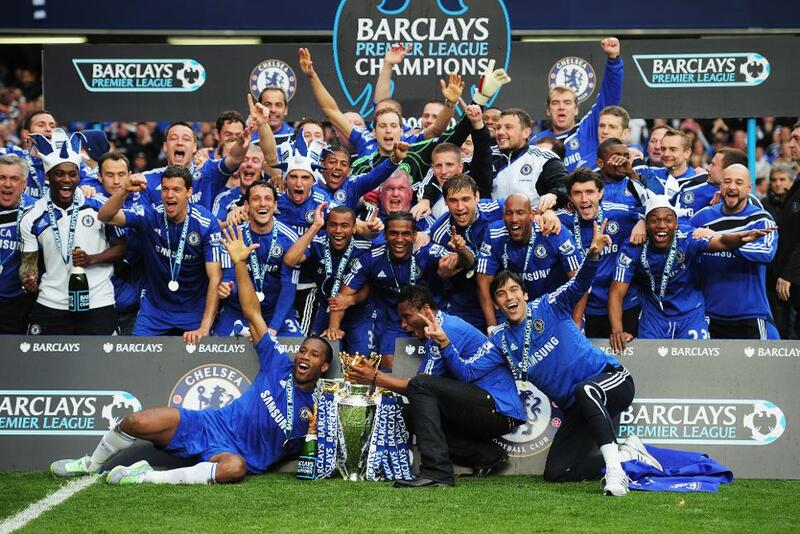 On 3 April, Chelsea moved to the top of the table with a 2-1 win over previous league leaders Man Utd at Old Trafford. Goals from Joe Cole and Didier Drogba swung the title race in the Blues' favour, and they followed that up with three wins out of four, including a 2-0 success against Liverpool at Anfield. That meant they held a one-point advantage over United going into the final day and they sealed their third Premier League title in record-breaking style as they beat Wigan 8-0 at Stamford Bridge. Didier Drogba's hat-trick meant he won the Golden Boot with a tally of 29 goals, while Chelsea's 103-goal haul in the Premier League meant they were the first top-flight team to reach a century of goals since Spurs in 1962/63. Chelsea manager Ancelotti also led the Blues to glory in the FA Cup final against Portsmouth, who enjoyed a remarkable run to the final despite suffering relegation from the Premier League and a nine-point deduction after entering administration. They were joined in the Championship by Burnley and Hull City, who went down after two seasons in the top flight. With Arsenal safely in third position and Aston Villa dropping off slightly in the second half of the season, the race for fourth was between Spurs and Man City, and the two sides met in a crucial encounter in the penultimate match of the season at the Etihad Stadium. It was Spurs who came out on top as Peter Crouch headed in the 82nd-minute winner, which ensured Redknapp's side UEFA Champions League qualification and a top-four finish in the Premier League for the first time. Man City finished fifth, while Villa and Liverpool took the remaining UEFA Europa League places – a competition that was lit up by surprise package Fulham in the 2009/10 season. Roy Hodgson's side knocked out a host of top European clubs, including Shakhtar Donetsk, Juventus and Hamburg, before finally being beaten by an extra-time Diego Forlan goal in the final against Atletico Madrid.